Quality Glass Inc. is thrilled to announce that we now offer LuxClear Glass. LuxClear, manufactured by AGC, is anti-corrosion glass designed to keep your glass shower looking new and clean longer. The LuxClear coating is added to the glass during manufacturing as opposed to after the fact, allowing it to fuse and permanently seal the glass surface. This eliminates surface corrosion of the glass from exposure to water, heat and humidity. The result is glass that stays looking new and clear for the life of the shower. Quality Glass Inc. is excited to offer LuxClear Glass because of how it withstands water and time, and as with all other glass products it can be cut, drilled, polished and tempered. This means we can create custom showers with LuxClear Glass to fit any space or design requirements. And our customers love that LuxClear Glass does not require any special cleansers – it can be cleaned as you normally would with any other glass! 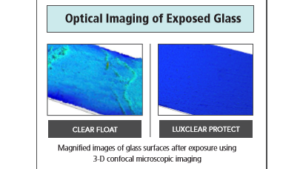 You can learn more about LuxClear Glass here – or call us at Quality Glass today!